These featured projects from Gregstrom demonstrate more than just our rotational molding and thermoforming capabilities. They show how we add value through services such as design assistance, assembly and testing, and shipping. Gregstrom Corporation provides custom rotomolding and heavy-gauge thermoforming services you can count on. That’s not all we can do for you. As these featured thermoforming projects and rotomolding projects show, we support every phase of the design, manufacturing, and distribution life cycle. Check out our portfolio, too. 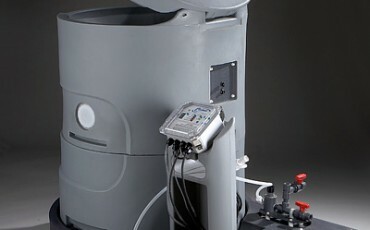 Chemical feeders prepare and automatically dispense the chlorine that’s used to disinfect municipal and large commercial water systems. Gregstrom took this project from concept and design through manufacturing, assembly and testing, and shipping of the finished product. 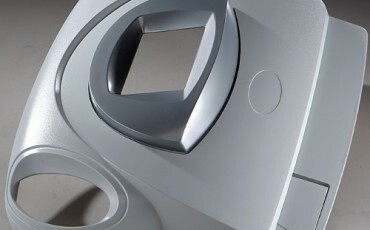 Medical laser assemblies need to meet demanding requirements for performance, cost, and appearance. This pressure forming project targeted not only Gregstrom’s technical capabilities, but our commitment to part quality, attention to detail, and management of finished goods and inventory releases. 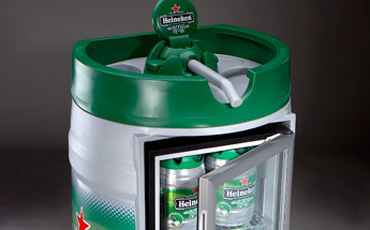 Heineken draught keg coolers are POP displays that replicate the look of the Dutch brewer’s 5-liter metal beer keg. These units also store up to 250 pounds of refrigerated product. Gregstrom assembled the finished display from 40 off-the-shelf hardware components, five custom-fabricated parts, and five rotomolded parts. We then packed and shipped the assemblies directly to Heineken distributors. Start a Project. Build a Relationship. For nearly 70 years, Gregstrom Corporation has been forming and molding plastics at our Made in the USA manufacturing facilities in Massachusetts. To learn how our custom rotomolding, heavy-gauge thermoforming, assembly and testing, and finishing services can add value to your project, contact us on-line or call (781) 935-6600. Watch a brief, step-by-step demonstration of the thermoforming process. Watch a brief, step-by-step demonstration of the rotational molding process.